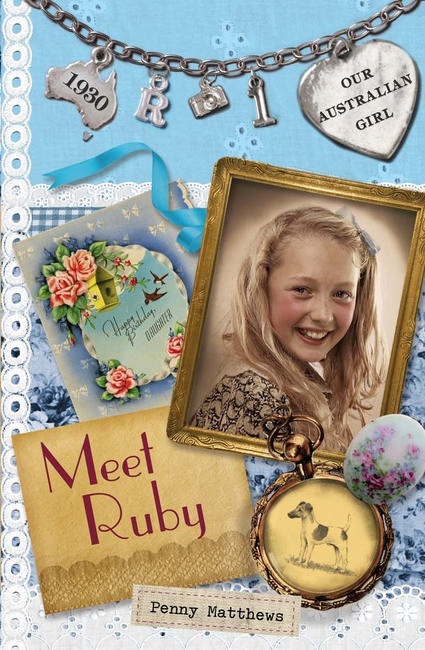 Ruby Quinlan lives in a big house in Adelaide, she goes to a private girls school, has a house keeper and fox terrier. She has just turned 12 and got a camera for her birthday. Then little things start to happen that she doesn’t understand. There is the boy who sleeps one night in their garage, the man who will do anything just to get a little bit of money and the arguments between her parents. Then one of her friends doesn’t came back to school after the holidays. The world around Ruby is changing and her familiar, comfortable life falls apart. 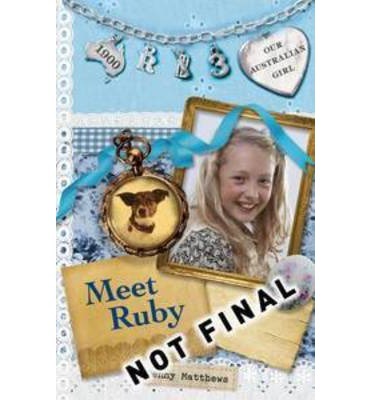 This is one of the Our Australian Girl series and these are wonderful books. They are easy to read, and their distinctly Australian edge makes them rather unique in the middle grade fiction category. Ruby is an easily relatable character. She is young, enthusiastic and a little unaware of what is going on around her. When things change she is going to have to change with them and it is going to be interesting to see how her character develops throughout these four books. One of the great things about this book is it gives the reader a wonderful insight into living in Australia at the start of the Great Depression. Skye has an identical twin sister. They always do things together, that is they used too but recently Skye has been wanting to different things and she is feeling a bit left out. She is as the point where she really believes everyone is far more interested in Summer. To make matters worse her friend Alfie confesses to having a crush – on Summer, which hurts more than Skye expected, and her best friend seems more interested in hanging with her sister. Then Skye finds herself drawn to the mystery of one of her ancestors, something her sister wants nothing to do with. FInally maybe Skye can learn to be her own person and maybe people will begin to notice her for who she is, not just because of her sister. Skye is a slightly quirky and incredibly appealing character. She is a wonderfully drawn girl who is struggling to find herself amongst the pressures of a blended family, having a twin who excels and the need to grow up. The way Cassidy has developed the family is very real and touching. As with most families there is chaos and clashing wills. This is the second of the Chocolate Box Girls series and you don’t have to have read the first to enjoy and understand the second. Cassidy deftly and honestly deals with that awkward time of life when you being to discard the childish things in favour of the less childish ones. There is a dash of mystery, some good laughs and the honest texture given to it all through the lens of blending two families and and finding out who you really are. If you are a fan you will love this, if you haven’t read anything by this writer before she is well worth picking up and giving a try, especially if you are a reader or know a reader who prefers stories more grounded in reality than fantasy. Read this and allow the heartache and joy of this story to wrap around you. The Thea sisters are on their way to Paris for a holiday. No adventure, no mystery, just good old fashioned rest and relaxation, though with Colette as their guide you can be assured of plenty of shopping. They even plan to attend a fashion show where Colette’s cousin Julie will be showing her designs. After they arrive strange things start to happen. Julie’s designs are stolen and someone breaks into her flat and steals her computer. None of it makes any sense and the Thea sisters are once again thrust into a mystery, can they solve this one and help Julie get her show back on? Fun and fashion in Paris, where else? These books are written in a way that younger readers will find engaging – visually interesting, filled with interesting little facts and five distinctive personalities. I have no trouble recommending these books. 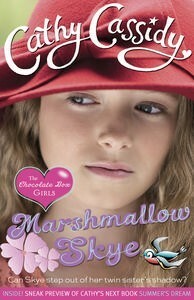 This one in particular will appeal to girls who, like Colette, likes clothes. It’s easy to enjoy to enjoy these books on the surface but they have a deeper theme of friendship and difference. Friends don’t needs to be the same or look the same, they also don’t always have to agree, they are always there for each other and this is a good thing for our children to be exposed to. The Thea sisters are in place waiting for a scoop when Paulina gets a phone call from home. A friend is missing and Paulina plans to leave straight away. The others won’t let her leave alone, so the Thea sisters set off on another adventure. Once in Peru they head up into the Andes Mountains to find Paulina’s friend – a missing archeologist. 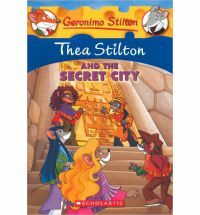 It soon becomes clear that it isn’t just about finding Paulina’s friend but following clues to an ancient hidden city. South America is the location of this adventure and as always along the way great snippets of information are seeded into it. This is a great way to take younger readers out of a narrow view and throw a bit of the world at them. This story moves at a brisk pace and the visual presentation of these books make them a great choice for readers either learning to read (so with help) or for more confident readers looking for something more challenging than the short, large print beginning chapter books. It all starts when the Thea sisters’ biology professor disappears. The girls are unwilling to wait so set out to see if they can find him. They get to his lab they hear an alarm, so they investigate. Fortunately they are able to decipher a message the professor is sending and they venture out underwater to rescue him. In the process they find out about a shipwreck and a priceless jewel and of course some mice who want to keep it all for themselves. Just when it seems this adventure is over they are invited to China to help a friend of Violet’s find another treasure – the Jade of Truth from an old Chinese tale. Will they be able to uncover the clues that have been hidden for so long and keep such a precious treasure out of the paws of Madame Hu? In this installment the sister’s take us on not one but two adventures. The pace remains brisk and the stories are fun, not too scary even when the girls get trapped or kidnapped. The journey through China comes with snippets of facts from both modern and ancient times. These girls have adventures all over the world and are capable of doing so many things, it is wonderful to see characters like this. Silly as it may sound it shows girls don’t need to be limited in what they want to do. These are a fun addition to any shelf. 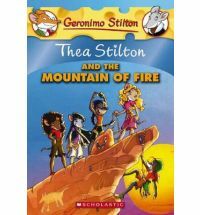 Thea Stilton is invited to teach a class on adventure journalism at her old school – Mouseford Academy. She is very excited. As soon as she arrives she is introduced to five amazing students; Nicky, Colette, Pamela, Paulina and Violet. Not long after getting reacquainted with her old school another student disappears. He is not the thing missing either. With such strange things going on someone has to step in and solve the mystery. It’s a good thing the Thea sisters have a nose for finding clues and quick minds to help them put the puzzle pieces together. 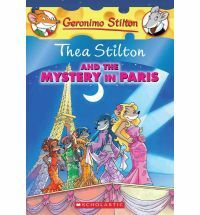 This is the first of the Thea Stilton books. 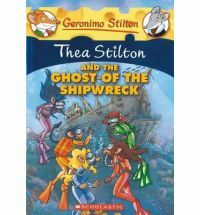 The format is the same as the Geronimo Stilton books – wonderful illustrations and colourful formatting, though it is slightly longer than the books in the original series. This series is about five students from various corners of the globe who become close friends. They have very distinctive personalities and bounce nicely off each other. If you are looking for something for an avid younger reader – or a way to keep a learning reader visually interested (though they are rather text heavy so probably best to read with the child), then these books are a good choice. It is an added bonus that they are fun little mystery stories. There is an emergency back home on Nicky’s family ranch in Australia. The sheep are losing all their wool and no-one knows why. Nicky has to return home to find out what is going on and her friends won’t let her do it alone. So the Thea sisters set out on another adventure. This journey takes them from the ranch to the secret place of Nicky’s ancestors, where they hope to find the cure to what is making the sheep sick. The trip involves a plane, a train, a car and a boat. Along the way they get invited to an Outback Ball. 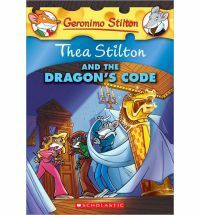 The Thea Stilton books, like the Geronimo Stilton books, are a lot of fun. Set in the same format with coloured illustrations and coloured text these books are slightly longer than the Geronimo ones, which makes them a little more of a challenging read. The characters in these books are five girlfriends from all around the world, who are smart and love solving mysteries. With plenty of text and five wonderfully different characters these books are a popular read with female fans of the original series. Any girls is bound to identify with at least one the the sisters. Highly recommended if you want something with mystery, adventure and no fairies.